I am 61 days from race day. I'm not sure how I feel about that. It's at that point where it seems both really freaking close and really far away. This week was actually really outstanding, my first time hitting 80 in a week, and following that with a solid 20 miler on day eight. 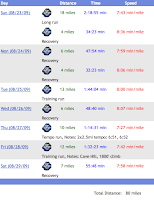 Of particular note was the long run, which not only had a solid average pace, but actually had the last six miles at closer to 7:30 pace, with the last mile in 6:45. Then I did my first long run day double, which didn't feel too bad. Thursday's tempo was alright, it was hot and I wasn't really excited about it. I hit pace and ran well, though, so good effort there. Friday was the week's surprise day -- I had to go out for 12 miles by myself, which sounded awful, but then I walked outside to find it about 50 degrees and absolutely amazing. I cruised along happily at a surprisingly good clip, especially considering the mileage my legs were already carrying. Not much else to say about the week. Other assorted updates to follow, hopefully one tomorrow about my weekend adventuring with my "manfriend" TT as he took on Ironman Louisville. I'm in a post-long run stupor right now, sitting in bed after a nap with a bottle of sparkling italian mineral water and a box of junior mints. I think it's well-deserved. This post probably should be done on Saturday, since that's when I end my training week ... But I work on Saturday and not on Sunday, so here we are. I knew this week's mileage ranked amongst my highest totals ever, but I thought I had gotten in more 70+ weeks in the past than I have. Digging through my log earlier shows I've only hit 70 twice, both times before Memphis in December 2008: a 73.8 in late September and a 74.5 in early November. Hmm. That makes this week -- a 74 -- the second-highest of my life. And I feel pretty good. Really good considering my very snappy pace over 18 miles today, although I will mostly attribute that to the gorgeous weather. I hate stale junior mints. This week -- click on the picture for the log -- included way more double-digit days than I'm used to, both in singles and doubles. 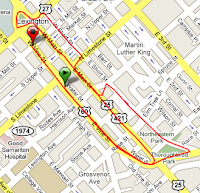 My long run was in Lexington, and may have been one of my worst runs. I felt awful the entire time. It was hot, I was dehydrated, my legs were trashed from the 5k the night before ... Blah blah blah. The rest of the week was good, though, especially after I saw my wonderful massage therapist on Tuesday. Everything felt smooth and solid all week. My heart rate and pace are both down, hooray quantifiable fitness improvements. 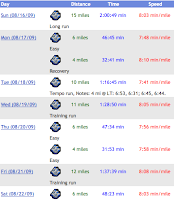 Not a whole lot of exciting runs, just one workout with four miles of tempo, but a lot of miles. Marshall University Marathon in 69 days. That's from yesterday evening when I got in from work. I mean, seriously? This weekend was the 25th anniversary of A Midsummer's Night Run 5k in Lexington. I ran this race last year for fun, in part because one of my best friends had a broken toe and wasn't going very fast. Now the same gal is married and has moved to Lex, so it seemed a great opportunity to see their new apartment (and their first place together) and get in some good runs. As you might guess, it's an evening race. It starts at 8:30, so you begin with the sun up and finish with it mostly down. Kinda neat. Weird for me because I rarely run in the evenings. It's a huge race, with 3,967 finishers this year. The course is a tight loop, lapping back on itself for part of it. They're using the D-tag chip system, but the start is still packed and crazy. I drove to Lex after work on Saturday and got there about an hour before the race. My friends actually live on top of the start line, so it was a quick elevator ride down to start our warmup. 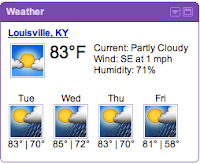 It was at least 80 degrees still, and Kentucky muggy. Several more of our Bourbon Chase relay teammates were racing, so we all hung out at the start for a few. Mostly I complained about how much I hate 5ks. I mean, really, I do. I was dead-set on negative splitting this race, which would make it my first 5k ever where I did that. I've never been sure before how fast to go out, so I usually just floor it and hang on as long as possible. My psuedo-coach and training partner, who has been there for all my recent speedwork, recommended I go out at 6:20 pace for the first mile then start dropping it down, trying to split under 6 for the end. I don't look around much at the start to assess the competition, because I know there will be plenty. There's a guy running barefoot, with his D-tag fastened to a rubber band; a mulleted women's masters runner in gear as old as I; etc., etc. My friendly Garmin 405 Cassidy was pretty handy in the negative-split endeavor, but I pretty much hit 6:20 out of the gate and then it was too dark to see the damn thing and I had locked the bezel for once so I couldn't activate the backlight. Sigh. The first mile feels easy -- that was the plan -- and I nail 6:20 on the dot. I'm trying to settle in and get comfortable, but there's so many dang 90-degree turns in this race I'm constantly running tangents and trying not to kill the soccer-cleated dude cutting every corner. Mile 2 is an "oops," a 5:58, but it's the only mile with a net elevation loss so maybe it's not my fault. I was getting into a rhythm though, and feeling much better than I usually do at that point. I get passed in here somewhere by a woman in purple, which I don't like (that I was passed, not the color purple). Somewhere in here I'm telling myself I have to learn race strategy somewhere, and I'm sighting other women and catching them. Mile 3 is a little more uphill, a little slower, but not bad: 6:07. I see purple lady ahead of me as we hit the final straightaway. With about a half-mile to go I ease on her shoulder and sit for a minute, then surge past and hold that pace for a few seconds. I can't tell if it's her I hear behind me or someone else, and I worry I went past too soon. I'm backing off the pace a little with a quarter to go, trying to not totally die before I kick after hearing the last mile split. As I near the finish, I hear someone right on my heels and hope it's not her. It's not. It's some dude. I don't care about him. I cross the line totally toast, and there's a race official stopping me and getting my bib number written down. I realize this means I probably placed top ten, since that's who gets plaques that evening. Oh yeah, I ran like 19:15 according to Cassidy (who also got the mileage at 3.16), and 19:19 according to my chip, which I think is crap because they had two chip mats placed like 10 feet apart. There's no telling which mat actually started my time. Whatever. Moral of the story is I hate 5ks slightly less now. My Bourbon Chase teammates all did awesome (watch out!) and I got a plaque for 7th place female (out of 1,999!). Then we had greasy pizza, drank whiskey sours (made with bitters muddled in your glass), stayed out till 3 a.m., got up five hours later and ran 15 miles. We roll hard. Tomorrow officially begins the 12-week block for the Marshall University Marathon. Which means all you lovely people can resume reading absolute nonsense about my training. Lucky, lucky. That's what makes running a fun game, right? Because you have no freaking idea which of the three will happen. Today's run was 14 miles with 2x10 minute tempo, made even more delightful by 80 degree temperatures and a 74 degree dew point. Yuck. Aside from that, it wasn't too bad because I like having runs broken up into chunks like that. Okay, that's all for now. More on training philosophy this time around to follow.